Three and a half years ago, we gutted the main floor bathroom of our 1921 home. It was ugly and quite disgusting. We originally hired someone to do the job, but after demonstrating work ethic that was deplorable, we completed the project on our own. I am so lucky to have a husband that can do almost anything when it comes to home repair and renos! This bathroom reno was major and every single item became a major design decision for me. I knew what I wanted and each item had to fit to perfection within the new space. I can honestly say that I probably spent 200 hours looking at fixtures, vanities and other accessories. I pretty much knew right then and there that I would never be able to have a new home built. I would literally drive the entire family crazy. Besides that, I don’t know if I could ever give-up on the character and warmth of a heritage home. 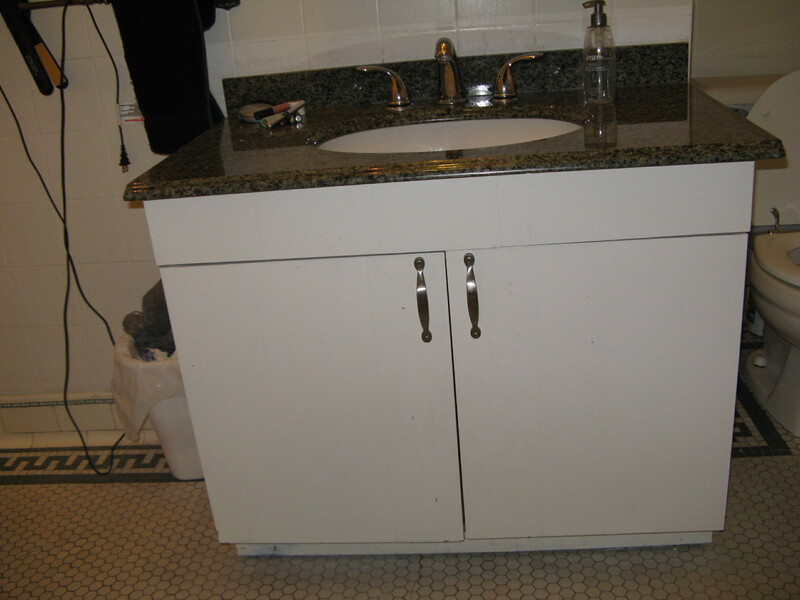 Look at this ugly vanity that was in the existing bathroom. It just had to go….along with the toilet, walls and pretty much everything else! I knew I wanted a Victorian Style bathroom and was determined to find pieces that complemented the look. We searched every bathroom store in the city and scoured the internet, but to no avail. In the end, I decided to look for an antique piece that could be converted into a vanity. So aside from shopping bathroom stores, I began to look at antique stores in the area. 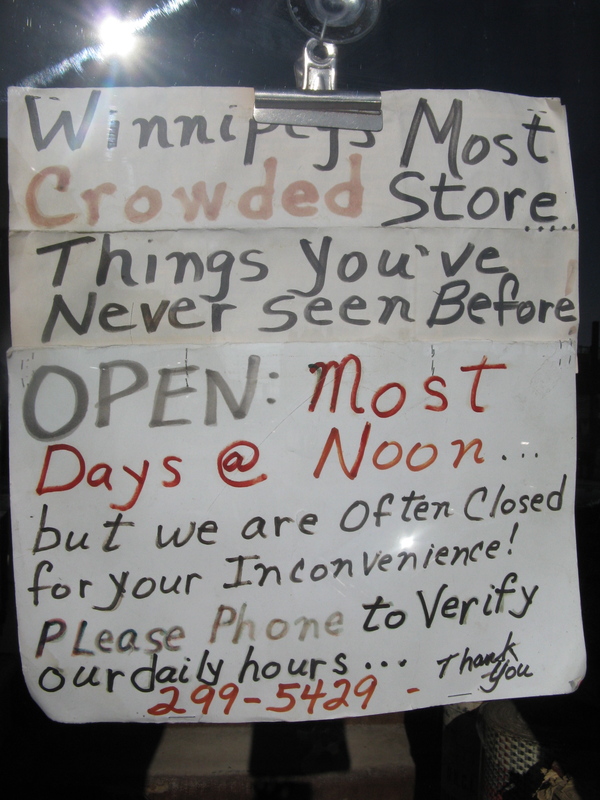 This sign was in the window of a local antique shop. Hilarious! One day, while visiting my one of my favourite stores…The Old House Revival Company, I explained what I was looking for to one of the clerks. I didn’t find anything in the store, but she invited me into the “staff only” portion of the basement to see if there was anything that caught my eye. As soon as I reached the bottom of the stairs, I saw it. The piece. The exact shape and style I was looking for. I knew it would be perfect, but was also quite sure that I would need an extra dose of sweetness and persuasive intellect to convince my husband. You can see the drawer fronts were actually just propped up and when I whent o open them all the pieces were shoved inside. So, you can see it was in less than perfect shape and my husband did not initially share my vision. However, he has also been with me long enough to know I would never let it go….this was the piece I wanted. We paid the $100 (cheap for a vanity), but perhaps not the greatest deal when you consider that it was in no way usable in its current condition. We sanded the piece down to the raw wood and then had a cabinet-maker from the area make new drawers on sliders to replace the old ones. 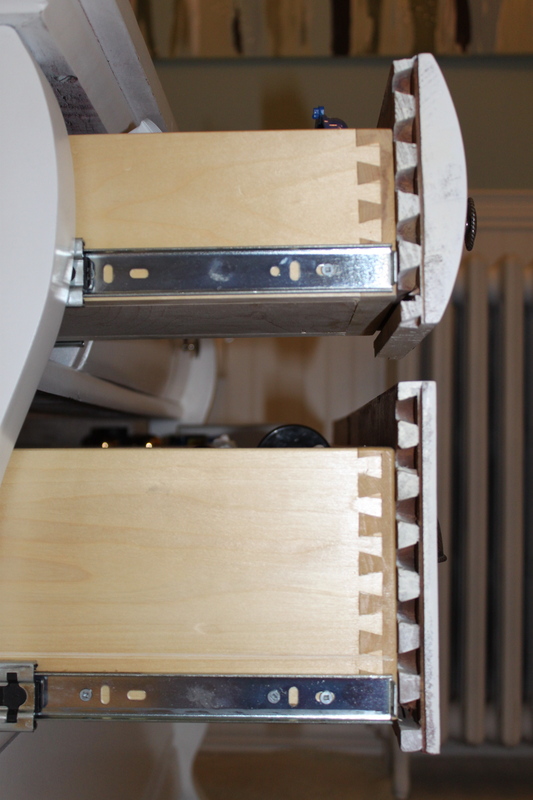 He used the existing drawer fronts to maintain the integrity of the piece. The original dovetail is still there and had to be left, but it is completely hidden when the drawers are closed. 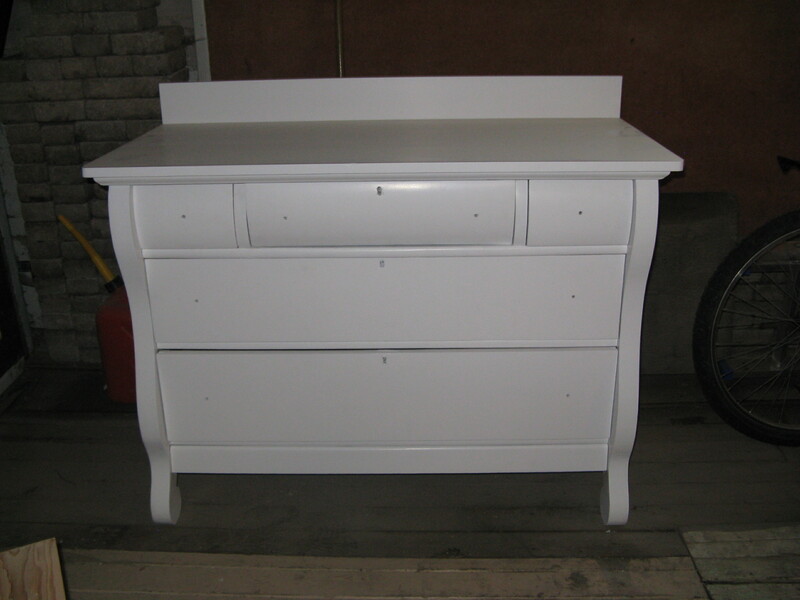 Here is the dresser all repaired and painted. This is just before the hole for the sink was cut. My cousin had a pottery sink in her bathroom and I always loved the look. I thought that pottery would be a perfect look with the vanity style…kind of like the old washstand with a basin. We went to a local pottery shop and I found a chocolate-brown sink that I immediately loved. It was $295 and I wanted to be sure there were no chips or anything so I was looking it over before purchasing it. When I turned it over, there was a slight crack on the bottom. I asked the sales lady about it and she said that “baking cracks” were common and that it wouldn’t have an impact on the integrity of the piece, but that she would give me a discount for the crack. It was on the bottom and would be completely hidden under the vanity top, so as long as it was not going to break, I was going to take it. I couldn’t believe it when I got to the till and she asked me if $50 would be an acceptable price! “Uhhh, yah!” We have had the sink for three years and there has never been a problem. What a score! I absolutely loved the finished look. The curves of the dresser and rounded drawer fronts were exactly what I was looking for. We were forced to lower the sink into the cabinet a bit more than I originally wanted to, due to the height of the dresser and clearance needed for the wall mount taps, but it turned out fine. We purchase the handles at Lee Valley and love the design of them. Posted on September 18, 2013 by Cindy Roy •	This entry was posted in DIY and Upcycling, Home Decor and tagged antique vanity, custom bathroom vanity, DIY bathroom vanity, DIY projects, furniture upcycles, unique bathroom vanities, upcycling, vanity dresser, victorian bathrooms, victorian vanity. Bookmark the permalink.